For a long time, fans of World of Tanks literally begged the developers to make constructive changes to the game in order to remove the imbalance. The requests were heard, and the developers decided to introduce the mode of ranking battles in the game client. This innovation is already running on the test servers and will appear in the game along with patch 9. 19, along with other improvements. Let’s take a closer look at the principal features of ranked fights, consider other changes that affect the economy and much more. When will be update 9.19 for World of Tanks? Recently was update 9.18 but now we have known release date of update 9.19 for World of Tanks. For testing, users will be given the opportunity to roll over all the changes made to patch 9.19, as it is for these purposes that the common test for update 9.19 – May 4th, 2017 will be available. More information will be posted later. 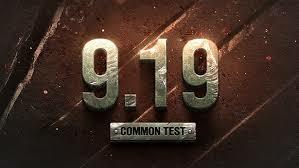 There will be a lot of changes in the update 9.19: the introduction of a new currency in the game, worked out improvements to the interface of combat missions and shares for WoT, as well as ranking battles. It sounds very, very strong, probably already many have a desire to try and get to know more closely with the innovation of the World of Tanks. Developers make improvements to the game’s interface, focusing on the feedback and wishes of the players. The first changes will affect navigation. Then, the interface of combat tasks, shares, a game store will improve, so that tankers can navigate in their favorite game with maximum comfort. If we talk about the changes in the interface, the following is planned: “Strategic tasks” – a tab displaying special offers and actions with complex execution conditions and unique awards. To improve navigation, related events will also be combined in this tab: “Special offers” – a section with sales and promotions of the game store. “Tactical tasks” is a section with information on available events that can be performed by the technique currently in the hangar. Such battles will take place in the standard format: 2 teams for 15 players. The peculiarity is that only tanks of the tenth level will participate in the battles. The battle conditions correspond to the random battle mode: the team that completely destroyed tanks of rivals or captured the base wins. However, here the analogy ends. The key feature of rank combat is a personal result. 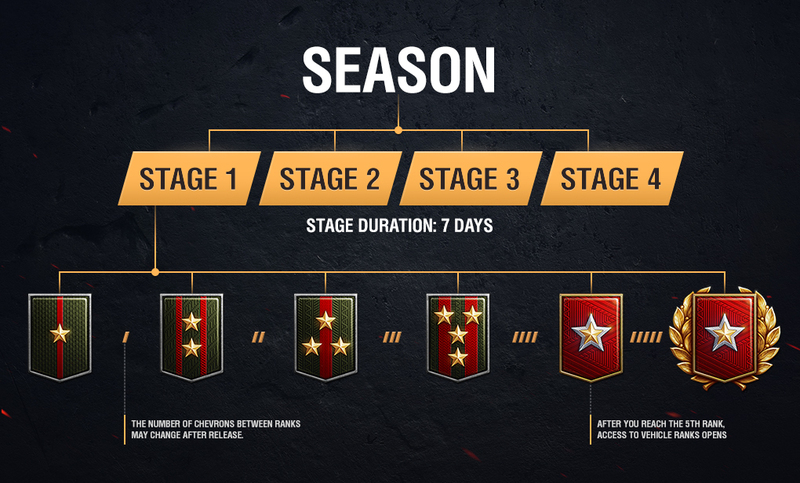 The essence of the plan is as follows: showing the high performance of the game, the tankers will move up in the ranking, increasing their rank, receiving interesting awards and prizes. If the tanker gets into the top 12 winners or in the top 3 of the losing team he gets a chevron. Chevrons are the key to getting the next rank. To climb the first step in the ranking and become the owner of the first rank one chevron is enough, but then the conditions will gradually become more complicated. It should be clarified that ranks 1 and 5 are original check points that preserve game progress. In fact, these are the starting points from which players can move further in the rating system. Curiously, 5 rank is the highest possible for the account. Having reached the top, the rank of technology begins to rise. Here the same principle operates: personal contribution to the outcome of the battle raises the rank of the tank. The only exception: here the number of ranks is offered in any number. Changes in the economy. In rank battles, an additional funding system is provided. Players are awarded the standard number of credits based on the results of the battle, plus to this, financial bonuses are added for obtaining the next rank, the performance of special tasks. To this is added the prize gear and personal reserves. When the season of ranked fights comes to an end, the participants are credited with the bonuses – a new monetary unit, which can not be purchased at the gaming store. The booms are spent for the purchase of modernized equipment and “Predobrovoe instructing”, which significantly increase the performance of the crew and the machine as a whole. The number of bonuses credited depends on the effectiveness of the player. In the future, there will be new ways of earning BONDS, but so far in the update of 9.19 it is planned that rank fights will be the only way. Bonds are the new currency for WoT, earned exclusively in the Republic of Belarus. Bonuses can not be bought, but you can only earn in the game, the accrual of which is made after the end of the season / stage. You can spend Bons on newly added equipment in patch 9.19. What can you buy for Bonds? Improved equipment purchased for booms, where you can not use two identical equipment on the same tank. Installed in slots with conventional equipment. The cost in bonuses is large, and is also withdrawn for 10 units of gold. Also, a new slot is added for additional BATS (pre-bug instructions), something similar to additional gold equipment adding bonuses to the equipment or crew, but only for one fight. Increases the effect of installed equipment. Instructions – for the crew. Helps to pump perk for one fight or improve installed, but you can not get two effects at the same time. Use all introduced innovations for bons on absolutely any class of equipment and level, for all types of fights.